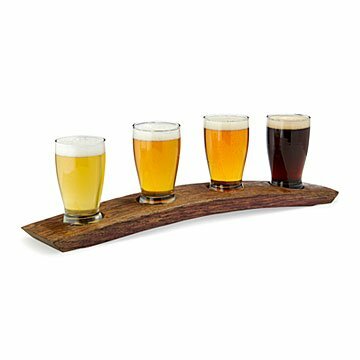 Serve up four of your favorite brews for a tasting on this flight handcrafted from recycled wine barrels. Wait, is this a man cave or a tasting room? Hard to say when you whip out a flight that looks this good. Each smooth, white oak server is handcrafted from recycled wine barrels—you'll notice the rich red stain from wine that matured in the original, preserved with natural oils. Paired with four taster pilsner glasses, this flight's all set to impress the crowd at your next get-together—go ahead, show "em you"re a master at your craft (beer). Handmade in Hampton, Virginia by Mike Prieto. Mike Prieto first began experimenting with woodworking out of necessity: He was trying his hand at replacing furniture he and his wife lost during a fire. But it didn’t take long for a true passion for the craft to evolve. After receiving positive responses to a piece he created from a reclaimed wine barrel, Mike realized his newfound passion could become a business. Since then, he’s specialized in handcrafting functional works of art from recycled barrels, turning what might otherwise be considered imperfections (like red wine stains on the underside of the staves) into special details that deserve appreciation. Wipe flight with a damp cloth. Glasses are dishwasher safe. This gift was a big hit !!!! My son will love presenting his crafted beers in this unique way.